captured two trains on this R R. N.York Philadelphia Willmington & Baltimore:/ and burned a trusselwork/: Gunpowder Bridge:/ 9 miles from here. 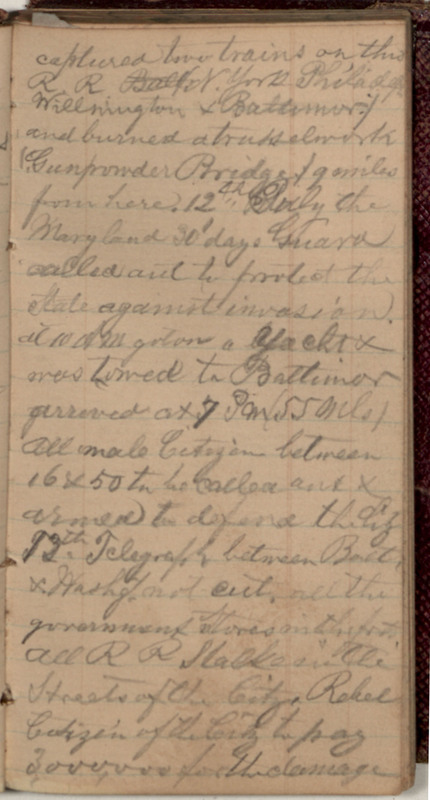 12th July the Maryland 30'days Guard called out to protect the State against invasion. at 10 A M got on a yacht & was towed to Baltimor arrived at 7 PM. (55 Mls) All male Citizen between 16 & 50 to be called out & armed to defend the City 13th. Telegraph between Balt. & Washgt. not cut, all the government Stores in the fort, All R R [Stocks?] in the Streets of the City. Rebel Citizen of the City to pay 3,000,000 for the damage.